I have a finished object. You may have caught a glimpse of it when the last podcast post popped up. It is Trillian by Martina Behm. 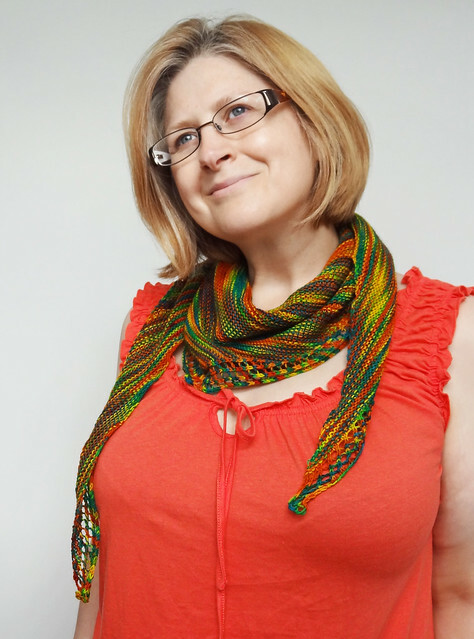 This is another pattern from Martina's Hitchhiker series of patterns. 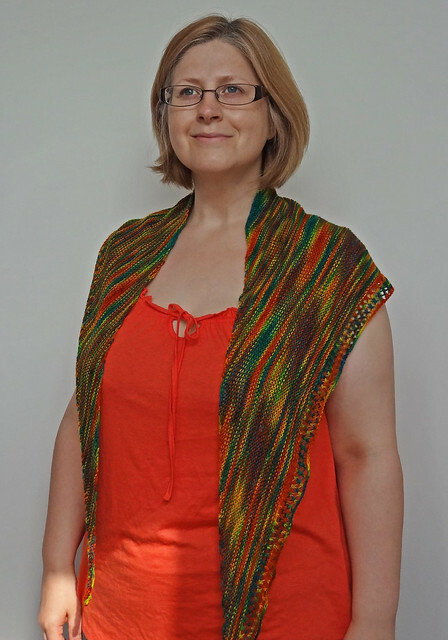 I have made a Hitchhiker shawl back in 2011 and really enjoyed it, so thought that this other pattern from the same series would be as fun, and I was right. The pattern was chosen as holiday knitting. 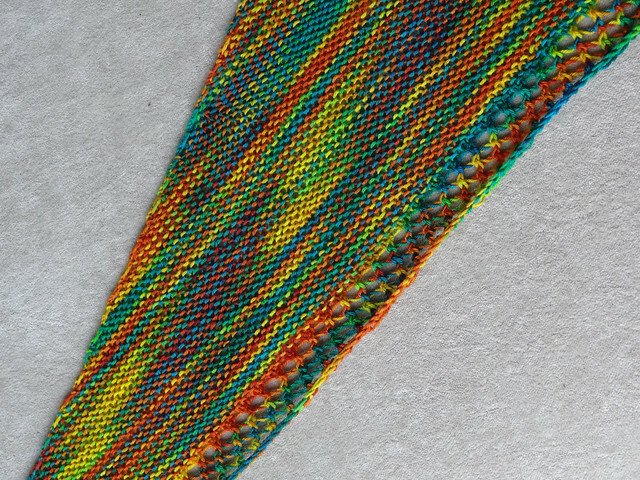 I wanted lots of fun garter stitch with a little bit "extra". This pattern was perfect. I used yarn from the easyknits Deeply Wicked range. It's a range of yarn I've wanted to use for a while, but was waiting for the right skein to pop up in an update. 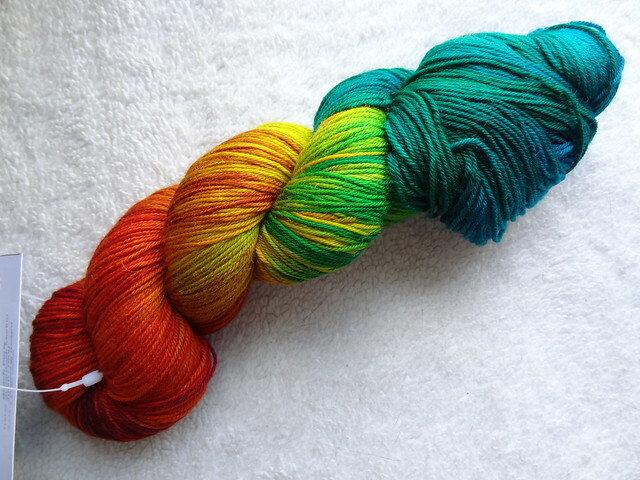 I finally got my hands on this lovely skein of Beach Party and knew it would be perfect for the Trillian. This kind of yarn needs to be treated carefully to ensure that it isn't over-powering, but also gets an opportunity to shine. The Hitchhiker range of patterns were designed with the Wollmeise yarns in mind. These beautiful hand dyed yarns often have vibrant colourways and because of this inspiration, I knew that the pattern would work with this 100% merino yarn, that shares so many characteristics of Wollmeise. 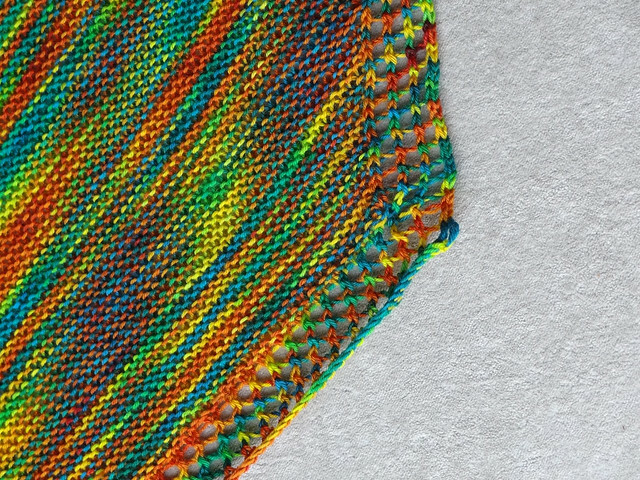 Garter stitch shows off colour changes beautifully, which is the basis for this whole range of shawls. In addition, the off-kilter shaping of the shawls make for some interesting shifts in the colours. The shawl is created on the bias with a simple lace pattern down one edge. The rest of the shawl is simple until there is a certain fraction of yarn left and then a matching lace edging is done along the whole width of the shawl before casting off. This creates an unusually shaped triangle shawl with lace edging. Sadly, as I took this as an holiday knit I didn't have any scales with me to weigh when I had reached the "percentage of yarn left" that the pattern instructed I have left, before starting the lace border. I had to guess and I guessed too early, which meant I have a smaller shawl than I would have liked, and have some yarn left over. However, it's an ok size. It's large enough to keep my shoulders warm if needed, but mainly I think it will be worn as a flash of colour at my neck, to liven up some of my more somber (ie black) outfits. It will remind me of the lovely places in Cornwall that I visited whilst I knit on my bright and cheerful Trillian. I really enjoyed this fun and simple knit, and would happily knit it again, if I found the right yarn. Maybe something with a slightly larger yardage to get a shawl with greater coverage. I think the simplicity and fun of Martina Behm's patterns are what makes them so successful. The resulting items are eminently wearable. As a result of this lovely shawl I am beginning to wonder if I should have bought the whole Hitchhiker book of patterns, instead of buying each pattern individually. I always thought I'd never knit anything other than the Hitchhiker itself, and look what's happened already! Who knows when the other patterns will become essential purchases!